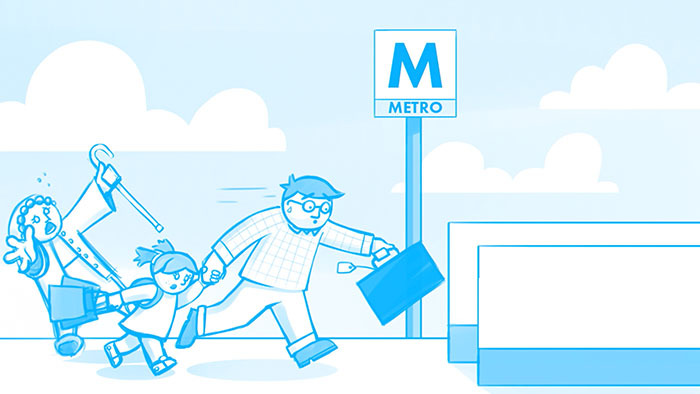 This 2D animation was used as part of the wider campaign warning against the dangers of rushing through platforms and blocking the escalators to catch the metro. ‘If you don’t slow down, you’ll ruin everyone’s day’ safety campaign came about as a technique to try and address the safety issues at stations each year in order to reduce personal injuries and delays to passengers. The satirical film features 2D characters who receive a range of injuries as a result of ignoring safety precautions while trying to catch the metro. The animation will be used on Metro’s social media channels in a bid to educate passengers about the dangers and reduce the number of incidents of people rushing to catch trains. This new campaign follows on from our award winning ‘use your brain near a train’ animation which we produced in 2013. We were tasked by Gardiner Richardson to create a 2D animation to educate passengers about the safety issues relating to rushing for the train and the dangers of blocking the escalators. Metro required a viral animation that would be shared & talked about to help raise awareness of the serious safety issues.